ConceptDraw PROJECT provides a user with the possibility to track how the project is going. Project Manager can compare the actual data with the planned and assess possible measures to resolve issues. The main tool for effective monitoring of the project implementation is the ability to save project Baseline. It includes the value of Baseline Start, Baseline Finish and Baseline Cost. All these indicators can operate effectively only in one case — if the project manager constantly receives information about the actual data compared with planned. ConceptDraw PROJECT has several types of visual reports that can help to assess visually the difference between planned and actual project data. When you set all resources and your project is ready, you need to save the Baseline. It includes the value of Baseline Start, Baseline Finish and Baseline Cost. Thus your Baseline data will not change if you need to edit your Resources. Windows: Save Baseline button on the Home Tab. macOS: Save Baseline command in the Edit menu. Activate the Solutions panel using button in the Toolbar. In the Visual Reports category select the Application of Project Budget report. The Report Window will open. You can change report parameters if needed using the Report Parameters panel. Then, click the Generate button. The report will be opened in ConceptDraw DIAGRAM. 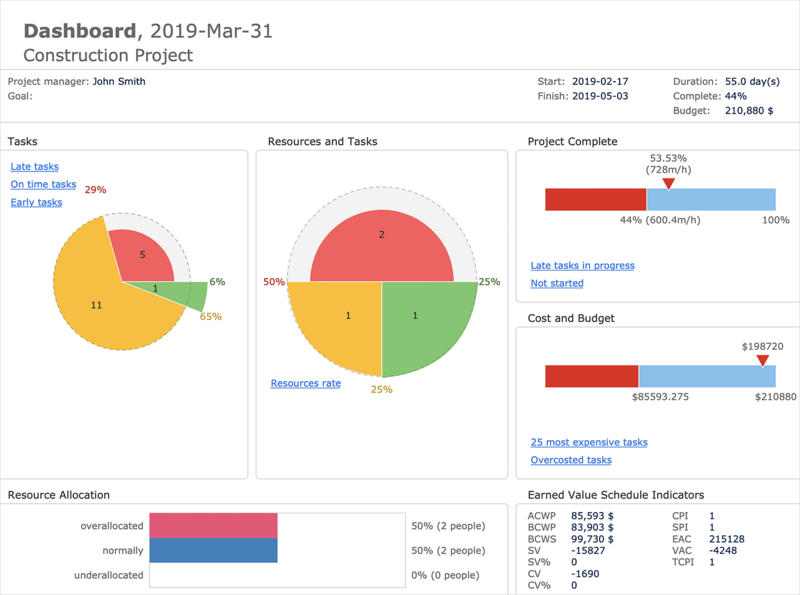 A visual project Dashboard, also, helps to estimate the actual project condition. Find out a Project Dashboard item in the PM Dashboards category in the Solutions panel. Use the steps, described above, to generate it. Result: Now you are able to compare the Plan and Actual data in the project visual reports and Dashboard.